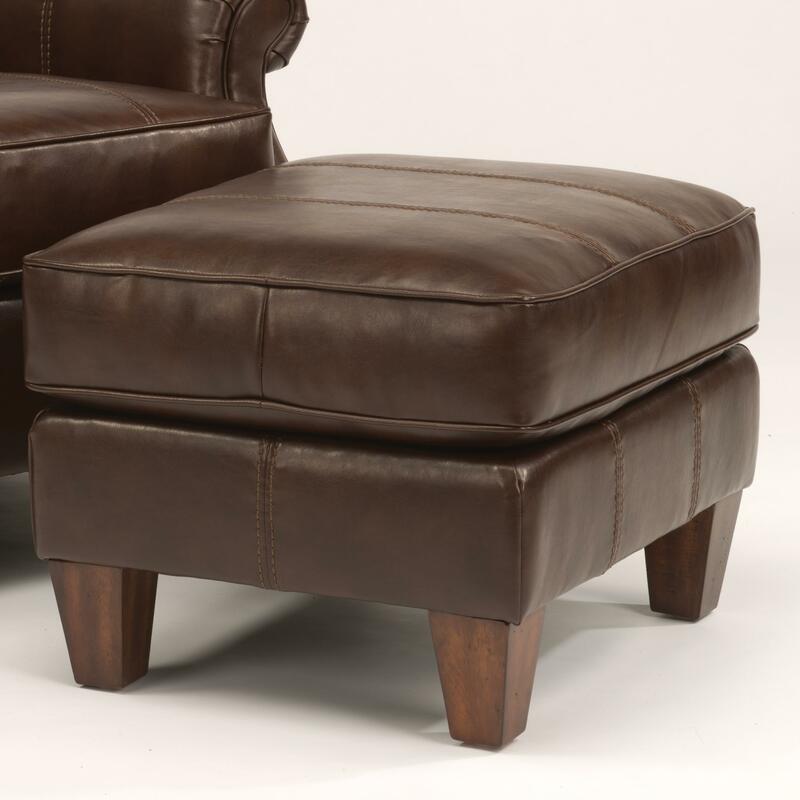 This standard sized accent ottoman will add a finishing touch to the chair from this collection. A piece designed for style and comfort, casual ottomans like this can complete a room with a look of luxury. Designed with a rectangle shape, exposed wood feet and smooth pulled upholstery, this piece can be used in casual, contemporary and traditional rooms. Weather taking advantage of its footrest quality or using it during gatherings for additional seating, this well constructed footrest will provide style and comfort. This ottoman is available with or without its coordinating accent chair. The Stafford Classic Styled Footrest Ottoman with Wooden Feet by Flexsteel at Virginia Furniture Market in the Rocky Mount, Roanoke, Lynchburg, Christiansburg, Blacksburg, Virginia area. Product availability may vary. Contact us for the most current availability on this product. The Stafford chair and ottoman collection will provide homes with a charming accent of traditional decor. Designed with a timeless furniture style, this chair and ottoman set features smooth pulled upholstery with decorative rolled arms and fine tailored accents. Made by a manufacturer known in the industry for providing top-of-the-line seat durability, this accent collection works well in couple as well as family homes. The Stafford collection is a great option if you are looking for furniture in the Rocky Mount, Roanoke, Lynchburg, Christiansburg, Blacksburg, Virginia area. Browse other items in the Stafford collection from Virginia Furniture Market in the Rocky Mount, Roanoke, Lynchburg, Christiansburg, Blacksburg, Virginia area.